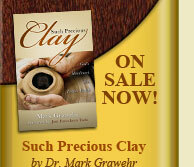 Precious Clay Ministries » Why Invite Dr. Mark to Be Your Guest? Dr. Mark Grawehr has quite a story of the master potter’s molding and shaping in his life and those around him. It has been said that Mark’s book Such Precious Clay “abundantly demonstrates that his life has the character of fine steel, tempered by suffering, strengthened by faith and made flexible by experience”. Often we struggle understanding God’s will for our life when actually he has already made that clear. Why do we resist his work in us and through us? It can be scary and painful; yet God has given us all that we need to become all we can be ‘in him’. Mark has been a special encouragement to those who’s lives are unfulfilled yet may have been too afraid to take the very steps that God would have for us to become more like him and experience his peace. Rising above the focus of our comfort, despite possible numbness or indifference, we may well even emerge as a kingdom building leader!